Wraps. When sandwiches get boring, wraps made with homemade tortillas add some variety. And almost everyone likes those bite-size spiral slices. Bagels with homemade yogurt cheese. I can buy bagels in my own bag at a couple of different bakeries. I haven’t had much success making bagels. Crackers and hummus. Unlike my bagels, my sourdough crackers taste delicious! Pasta salad with chopped vegetables. If I stash cooked pasta and chopped vegetables in the refrigerator, this takes no time to throw together. Green salad with chopped vegetables. Charlotte almost always eats salad. Celery with peanut butter. I use my own jar at the peanut grinding station at Whole Foods or buy bulk peanuts and just give them a whir in the food processor. Fruit chunks. Charlotte likes apples, mangoes, grapes, oranges and other seasonal fruit. Muffins. A reader told me yesterday that she bakes buttermilk muffins from the Nourishing Traditions cookbook, which I have. I’ll have to try these using my homemade buttermilk. 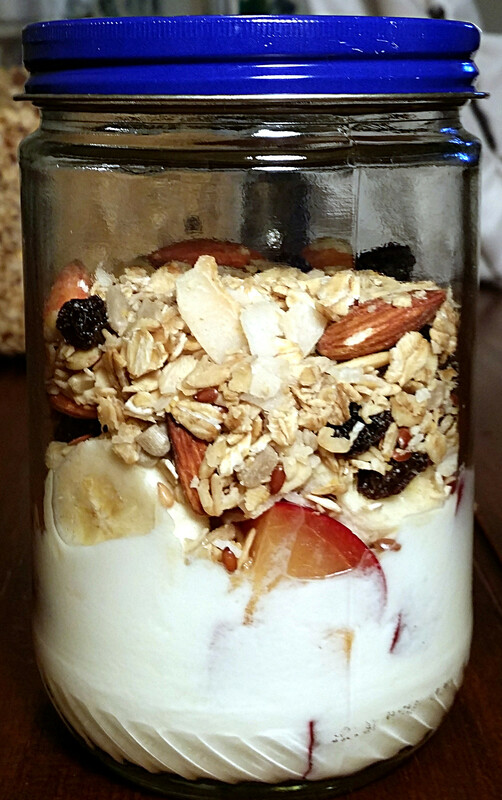 Yogurt, chopped fruit and granola. I make yogurt with milk from returnable glass bottles and granola with bulk bin ingredients. If you loosely plan the menu ahead of time, you can shop accordingly on the weekend and not have to resort to buying some unhealthy, packaged convenience food at the last minute. Some vegetables and fruit must be chopped just before serving, but you can prep others early in the week: carrots, celery, cauliflower and peppers all work well. Pasta can be cooked a few days in advance (toss it with a bit of oil before storing though). Making salad dressing Sunday night also saves time on busy mornings. By doing the little bit of prep outlined here, I’ll be able to throw pasta or veggie salads together quickly. For my water bottles, I use old glass kumboucha bottles and removed the labels (go here for how to remove labels from bottles and smells from lids). Initially, these cost a lot more than plastic baggies, but in the long run, you’ll save money since, unlike single-use baggies, you buy these only once. We’ve had our Lunchbots for at least three seven years and they still look great and work well. You can buy various types of stainless steel containers at Life Without Plastic. I also take my stainless steel containers to restaurants for leftovers, and to deli counters and grocery store hot bars to cut down on packaging waste. With smaller kids, avoid these. But for teenagers or yourself, glass jars in all shapes and sizes come in handy. In fact, if you want to go zero-waste and plastic-free in the kitchen start collecting glass jars now. They look wonderful when filled with beans, nuts, rice and other grains. You can store food in jars in the fridge or freezer (leave enough room at the top for the expansion of liquids as they freeze). And you can take them to some bulk grocery stores and fill them directly from the bulk bins (have them weighed first so the cashier can deduct the jar from the overall weight—you don’t want to pay for the additional weight of the jar). I pack salads for Charlotte in wide-mouth glass jars. First, I add the salad dressing to the bottom, followed by slices of vegetables that the dressing won’t render soggy—carrots, celery, peppers. Cooked beans could go in this layer too. Over this, layer lettuce or spinach, where it will remain crispy until lunchtime. At school, your child can shake up the jar to distribute the dressing. I’ll try this same method this year for yogurt, fruit and granola. I have inexpensive cutlery from Ikea (I know, it’s not the most environmentally friendly store, but I bought it years ago). You may be able to find some inexpensive cutlery at a thrift shop, yard sale or freecycle. I cut the napkins pictured above from leftover fabric and then finished the edges with a rolled hem on my serger. Tied furoshiki style around bread or a bagel or sandwich, these double as plastic-free wrapping. I sewed the crude cloth lunch bag above at least five nine years ago and it has held up extremely well (but now has stains). I copied the shape of a brown paper bag (four sides and a bottom), and I added velcro strips to the outside so I can roll the top down and secure the bag shut. I had all of these materials sitting in my scrap fabric pile. Total cost: $0. Thank you so much 🙂 The butchers at my Whole Foods no longer look at me as though I have recently escaped the mental asylum. Earlier this week, one of them actually thanked me for bringing my own container! But I understand your fear. I went to a different store on the weekend, more of a high-end grocery store in an affluent neighborhood. The guy at the fish counter looked at me with utter disbelief when I handed him my container. I went on to explain why I bring my own containers (to cut down on garbage) and he humored me but it was a bit unpleasant, feeling like the crazy container lady (I’m already a crazy cat lady). But this is how the butchers acted at Whole Foods a few years ago the first several times I brought my containers there. Once one of them called a manager to ask if it was okay to put the meat in my container. Or they would put the container in a plastic bag, or a plastic bag in the container…it took a while to train them 😉 Thanks for the book recommendation. I will look it up! Great tips for lunch making and planning! Thank you! Some lovely ideas here. Putting the salad dressing at the bottom of the jar, instead of pouring over the top is a great tip, seems really obvious now you’ve mentioned it lol. My current favourite is quinoa salad with chopped pepper, apple, cucumber, and chicken. And white balsamic, lemon, and evoo dressing. I make a big batch on Sunday and it keeps for 3 days in the fridge. I suppose it’s a bit boring eating the same for 3 days, but I’d rather that than be pushed into buying something I don’t really want! I’m glad you found the ideas useful. When my daughter first packed a salad this way, I thought it was pretty brilliant and wondered why I hadn’t thought of it. Your salad sounds filling and delicious, especially the evoo dressing 😉 Great idea to make a batch on Sunday. I’ll try to do that too. My older daughter likes to make something similar but with buckwheat. Couscous would work too. We have an insulated kleen kanteen for packing hot soups for lunch. My daughter also carries an insulated lunch bag – the first one I got her on the internet somewhere, lasted from the start of kindergarten until she started sixth grade last year and was ready for a change. (Her new one is insulated as well.) It’s great for those days when she wants her cold stuff cold and I slip a small cold pack in her lunch bag. We had a Lunchbots thermos but someone stole my daughter’s backpack with the thermos inside 🙁 I should get her a new one or check out the klean kanteen. Warm soup from home is a nice treat on a cold day. Great ideas here! I love your blog!! Great to see the use of glass jars for packing. I was recently skimming Pinterest for granola ideas and found everyone packing their granola in small, individual plastic bags. Dozens of them…hundreds…thousands!!! Nooooooo!!! Great ideas! My son starts kindergarten in a few weeks and my partner just went back to work. Soon I’ll have three lunches per day to pack, and I’ve been nervous about that. 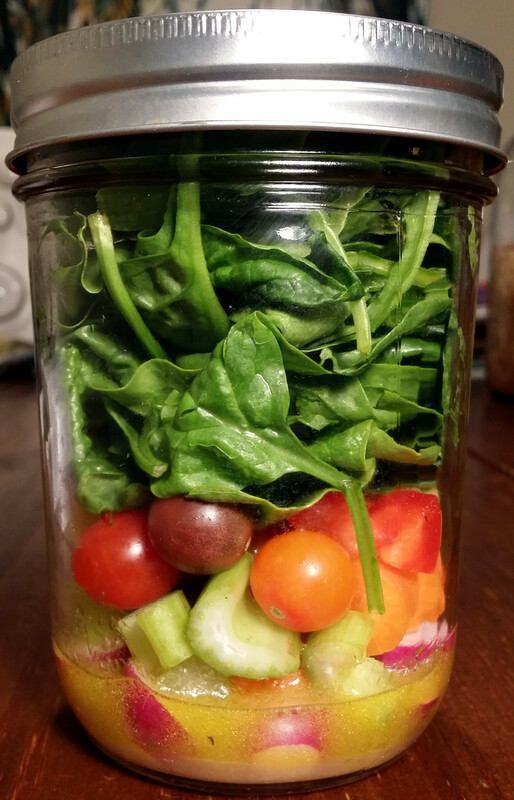 Love the salad in a jar idea! That’s exciting, your son starting kindergarten 🙂 I’ve been a bit nervous and I have only one lunch to pack (I started writing the post to help get myself organized this year). I’m glad you like the salad in a jar idea. My older daughter started us doing that. It works so well. Happy lunch packing! Hi! Love your blog. Inspiring post. Thank you so much 🙂 I love my jars. I have a large collection of them and still manage to run out occasionally. Fabulous sustainable ideas for a Zero-Waste Lunch! What great ideas! Love it!!!! Yes, it was a wonderful post! This is super helpful and works just as well for work lunches! Thank you! Hi, this is so helpful! I have a question: how do you put your cutlery in your lunch bag? I have a similar setup for my teenage son but I make one waste of paper towel that I use to wrap those cutlery – I do that so the used cutlery won’t dirty the cloth lunch bag (I bought it – I wish I had a sewing machine). Your napkins look too good to get dirty and stained by used utensils. I do not like plastics but I wonder if you can recommend a good set of utensils in a case – that I can reuse for lifetime. I welcome any suggestions! Your school should do composting to avoid bringing the mess home 😉 Ours and many others do, every afternoon 2 kids per grade go bring their compost to the pile. That’s a great point! Thank you for adding that. I am the compost program at my small office–I bring home the stuff in my containers. We don’t have composting facilities as far as I know but I will ask the facilities manager. Maybe we do and if we don’t, we should!